While many films choose to depend solely on either psychological or visual horror, Jeremy Saulnier’s “Green Room” masterfully blends both, resulting in a film with unparalleled tension and dread. For those who are “true”, Punk Rock is more than a genre of music, it’s a lifestyle. 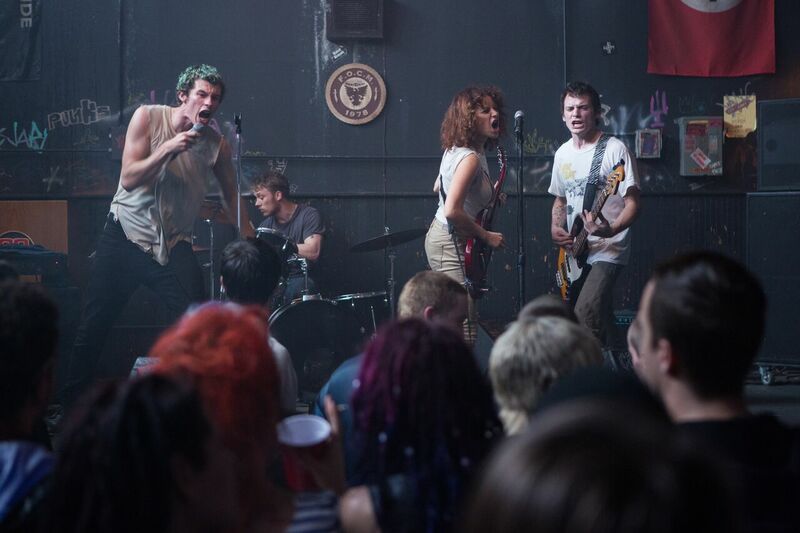 The four young band members in “Green Room” embody this lifestyle passionately. Traveling up along the Eastern US, they are always looking for the next paying gig. Their route is often decided on how much pocket change they have or where the nearest large parking lot is they can syphon gas from. When a large performance falls through, out of desperation they take a tip that leads them to a secluded backwoods venue populated with other true believers, of the White Supremacist type. After surviving their set, they are quickly rushed out of the bar, but their guitarist, Sam (Alia Shawkat) returns to the Green Room to grab her cell phone. There she witnesses the aftermath of a murder, and the apparent guilty party standing around. 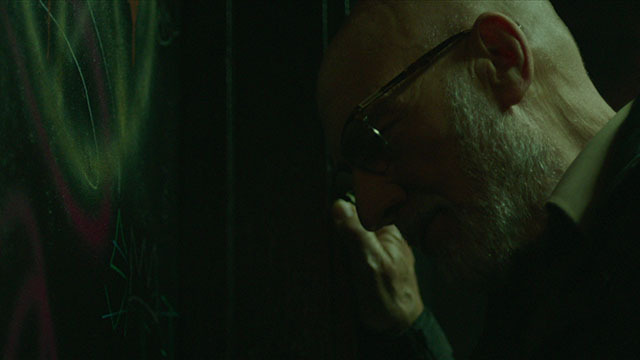 The venue’s manager, Gabe (Macon Blair) frantically locks the rest of the group in the room and calls the owner and fearsome leader, Darcy (Patrick Stewart). Once Darcy arrives, a mental chess match begins between trapped group and the calculating killers outside. The script excels in the way it slowly builds this tension, and addresses every question that the audience wonders. None of the characters are fools and while some of their choices are not the best, every action they take is calculated and rooted in logic. Comments made early in the film eventually take on more meaning and serve to complete a number of loose ends that a lesser film would have ignored. Expanding on the slow burn that Saulnier used to great effect in “Blue Ruin”, the tension is almost unbearable, when it is interrupted with startling graphic violence. The visceral brutality would be enough to shock on its own, but coupled with the underlying psychological battle makes it is exponentially more impactful. A script this sharp can’t stand on it’s own without a cast that can deliver it and make this extreme scenario seem believable. Thankfully, the entire cast excels, especially Patrick Stewart, in a such a shockingly cold blooded performance it’s hard to believe the same man valiantly helmed the Enterprise for all those years. Fellow Star Trek veteran Anton Yelchin also impresses, his role reminiscent of Hitchcock’s favorite trope; the average man thrown into an extreme situation. “Green Room” is not for all audiences, but for those looking for an unrelenting thriller, few others are this masterfully crafted.